Sessions are 50 minutes to an hour, session fee: £65. Claudia has been practising since 2002 and is KFRP registered. Health Kinesiology (‘HK’) is Claudia’s main therapy and focus. 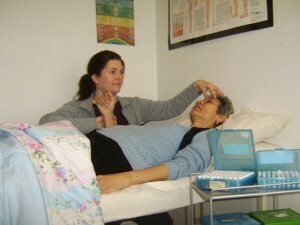 Other types of kinesiology protocols are often incorporated – Touch for Health, Emotional Freedom Technique, Assimilation kinesiology (essential oils) and Systematic Kinesiology. Kinesiology is a complementary health energy therapy for stress. It uses muscle testing, acupressure, essential oils, flower remedies and positive psychological affirmations. Muscle teating is the muscle check which tells you whether something is beneficial for the body or if it weakens the body’s systems. So the muscle test check is also useful for testing nutritional supplements. Allergy testing will often be done during a kinesiology treatment, or as a separate session. Kinesiology muscle testing connects with the inner body intelligence that is held in the heart, mind and higher self. How does kinesiology work? Each muscle has a connection with an organ, gland or function and acupressure points as well as an emotion group and chakra. Stresses in the body system are ‘read’ by the kinesiologist and balanced with acupressure, essential oils and flower remedies, nutrional supplements and psychological statments. Why do people have kinesiology treatments? It is used for stress and allergy testing and treatment. Relationship breakdown, work and exam pressure, detoxing, concentration and focus, digestive problems, hormone balancing, skin conditions, electro-magnetic pollution and healing emotional pain from their life experience. It connects a person with their clear soul path and akashik record for their highest good. The work that is done during the session helps the client be able to be more relaxed, and provides a deeper understanding and introspective connection as to.the causes of their symptoms. This also has the affect of hekping the clients feel more in control of their health issues. The fact that the work that is chosen and checked using muscle testing/checking means that it is exactly what the body’s inner oracle has chosen and knows that it needs; rather than another practitioner working only from their knowledge and intuition. It is relaxing and clients feel clearer about their life, less brain fog, and energised. In some cases an evening of rest is needed afterwards to allow the body to incorporate change from the healing. Kinesiology is done fully clothed lying on a treatment couch. The main systems of liver, digestion, kidneys and adrenals are checked as to their currrent status and then the kinesiologist carries out balances on the priorities that needs support – using acupressure, a specific muscle tested thought; essential oil. Often there is also a flower vibration remedy, or nutritional supplement to get and take for a few weeks to support the kinesiology energy work. Kinesiology is a useful tool for assessing both the emotional and physical stress in the body as well as the balances to do to counteract it. When there is stress whether emotional or physical in a person, their muscles have vibrational weakness which can be read by a trained Kinesiologist – similarly to how stress symptoms are demonstrated in a faster pulse rate and heartbeat, sweaty palms, and pupil dilation. Claudia connects with the heart centre and higher self and subconscious and consciousness of the client. Health Kinesiology usually uses the arm muscle as an ‘indicator muscle’ to connect to the inner body wisdom holistically. When Claudia incorporates Systematic kinesiology and Touch for Health techniques, other limb and arm muscles are worked with. Health Kinesiology is particularly useful for food & environment sensitivities; pain; digestive & skin problems; lethargy; moving on and letting go in relationships; work stress; confidence, self esteem; phobias; sleeping well; memory; achieving goals; balancing hormones; migraines. Touch for Health and systematic kinesiology work more directly with the subtle energy of organs and glands and this will often form part of the kinesiology session with Claudia. Acupressure, flower essences, essential oils, polarity magnets, sound, and muscle tested psychological and emotional thoughts form the chi energy work. These can support a client’s life goal, counteract a stress from past emotional experience, reduce anxiety and allergy and other physical symptoms. Issues that block one’s potential can be approached more easily from a new perspective. Health kinesiology brings physical healing, relaxation, clarity & focus, inner peace & calm; being more grounded, centred and connecting with one’s optimum life path. Clients will be asked about their lifestyle, their physical and emotional concerns, problems in their life, past health, family, and current life goals. Muscle testing is used to determine the session; to gauge the particular kinesiology balances needed to meet clients’ concerns. The priority areas requiring work are identified. Home self-help advice such as a positive affirmation, changes to diet, foods to avoid, nutritional supplements, a flower remedy and other particular lifestyle pointers, such priority things to avoid or do, may be muscle tested and recommended to support the subtle energy work that is done in the session. Kinesiology works with the body’s internalised chi, meridian energy, chakras, auric field and the mind. Kinesiology helps the person turn around limiting thoughts and relieve disturbing memory tags. Kinesiology enhances the body’s internal Chi (or Qi) energy resource, removing blockages in chakras and meridians and auric field so the body’s natural sublte energetic healing is supported. Our Chi can get degraded by adverse external forces, events in our lives; and what we put our bodies through. Kinesiology facilitates change in the subtle energy system, stuck patterns, and cell memory in order to optimise and restore the body’s own subtle healing resources and the natural Chi flow. Health kinesiology supports physical healing, relaxation, clarity & focus, inner peace & calm; being more grounded, centred and connecting with one’s optimum life path. Geopathic and geopsychic disturbed energy patterns in the home or workplace can be assessed and remedied. Sometimes there are disturbances in the home or office environment that can be contributing to symptoms such as previous inhabitants’ energy, neighbours, electromagnetic fields, nearby building work etc.